Signed and numbered US first limited edition. 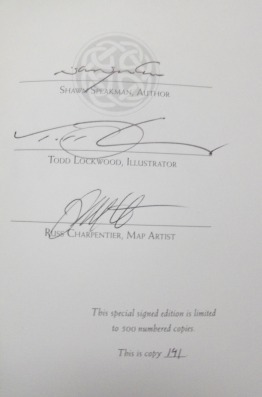 Leather-bound Signed & Numbered 1st edition/first printing edition that is limited to only 500 copies, is triple-signed by author Shawn Speakman, artist Todd Lockwood, and cartographer Russ Charpentier who supplied the map of Annwn. 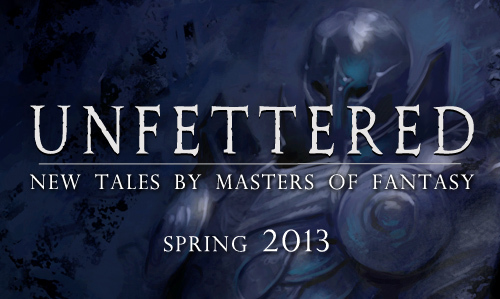 The number of this edition gives the purchaser the right to purchase the same number of the Signed & Numbered edition of Unfettered (details of this second volume are below), the forthcoming short story anthology by some of the best writers working today. Synopsis for "The Dark Thorn" : Beneath the streets of Seattle, a long-forgotten war is about to be renewed....Richard McAllister, a spiritually destitute homeless man and Knight of the Yn Saith, protects one of seven portals linking his world to that of Annwn, where the fey Tuatha de Dannan of antiquity have been relegated by a long-running religious war. The three men are on a collision course with history—and their futures. For in the wilds of Annwn, death comes as easily as magic. Haunted by a past he can’t forget and a knightly responsibility he can’t shun, Richard is drawn into levels of machinations—and two worlds—far darker than any he has prepared for.